As you can see, if you’ve visited my blog before, it’s got a new name, a new look, a new address. I thought it was about time to switch to a domain and a name that is a bit easier than lotta.skriva.net and Araneida’s web. The latter has been the name of my personal blog for about two years. Before that it was The Many Faces of L. and before that (if I haven’t forgotten a name switch in between) it was Lotta at work, dating back to 1998. 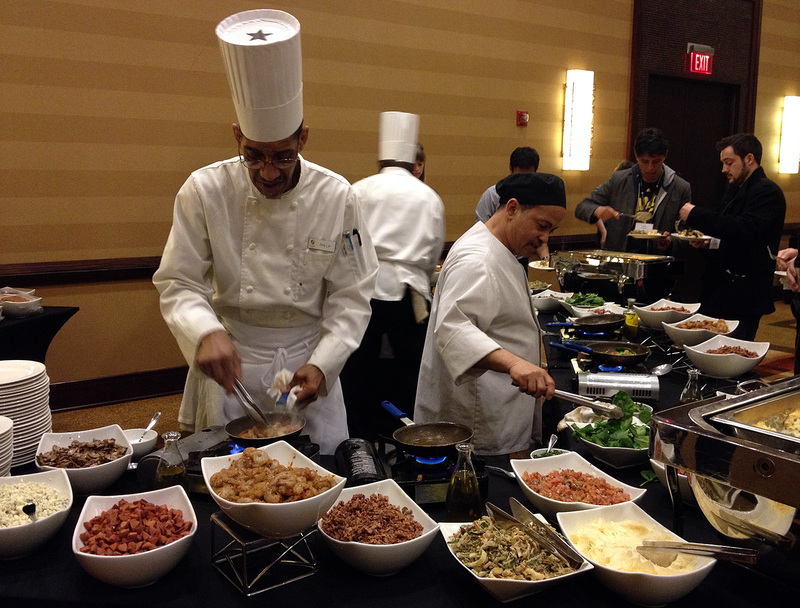 This blog has seen many shapes and phases, as has my other blogging projects. I thought I’d get a bit nostalgic for once and tried to find some old screenshots. 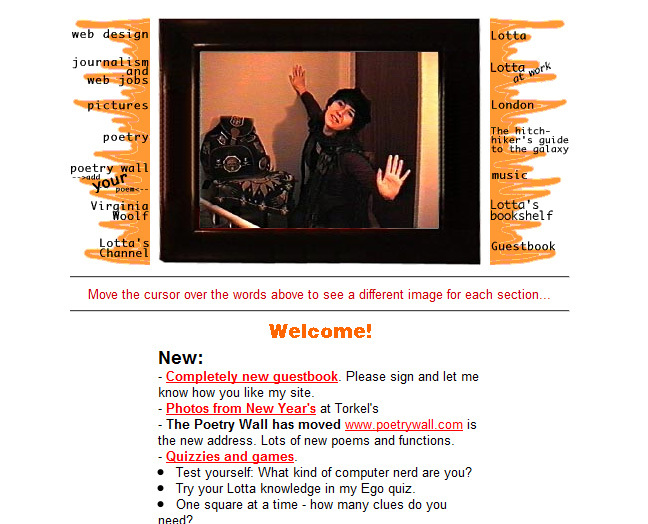 My first personal website was built in 1995, displaying some of my interests. 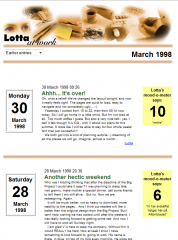 I started blogging, or rather writing an online diary or “reload”, in January 1998. 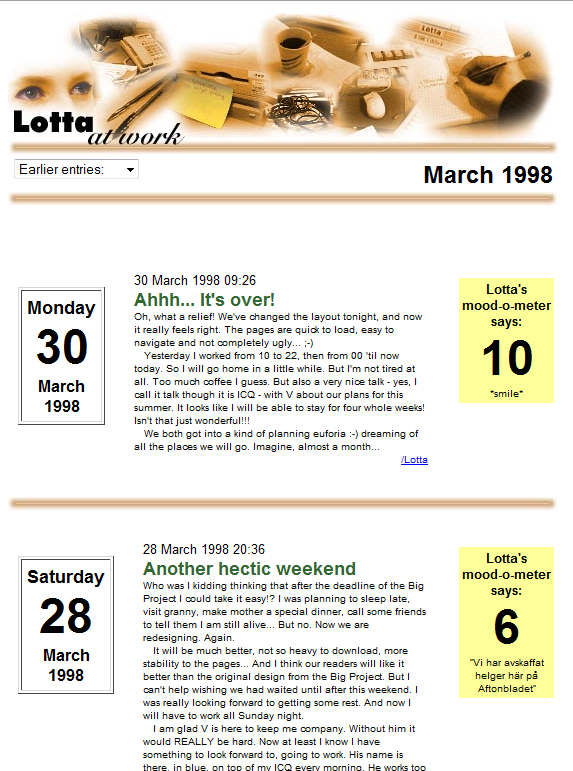 The name of the blog was “Lotta at work”, a play with home/work notion that, in retrospect, didn’t quite work. I shared quite a bit of personal and even private stuff, being at times very emotional, which you could see if you checked out the mood-o-meter, and indicator from 0 to 10 how I was feeling. The mood-o-meter lived on until the birth of this blog, so it’s a bit strange to see it go, but it was time. I kept the pages about some of my interests, making the blog a sub-section of my personal website. Some of the things I wrote about were music, and in particular the rock group Queen, London, journalism, Virginia Woolf, The Hitch-Hiker’s Guide to the Galaxy, casting, Walt Whitman, my cat, and pages for displaying my photos and also a guestbook. The homepage of the site changed its appearance a few times. At some point it was an image mapped to the different sections of the site. I only found a small screenshot of it. Displayed next to each post was a webcam image taken when I posted it, hence “Faces”. Also the header had some stylized photos in it. I had wanted the title to display “Faces” and “Phases” interchangeably, but never got that to work. The mood-o-meter was made to look like a kind of thermometer. The basic layout is pretty much the same that has lived on until today, though the name changed once more in early 2008. 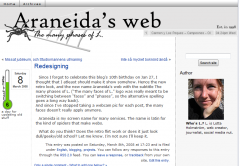 I decided that I wanted the blog to reflect my online alter ego Araneida, which is latin for the kind of spiders that make spiderwebs. 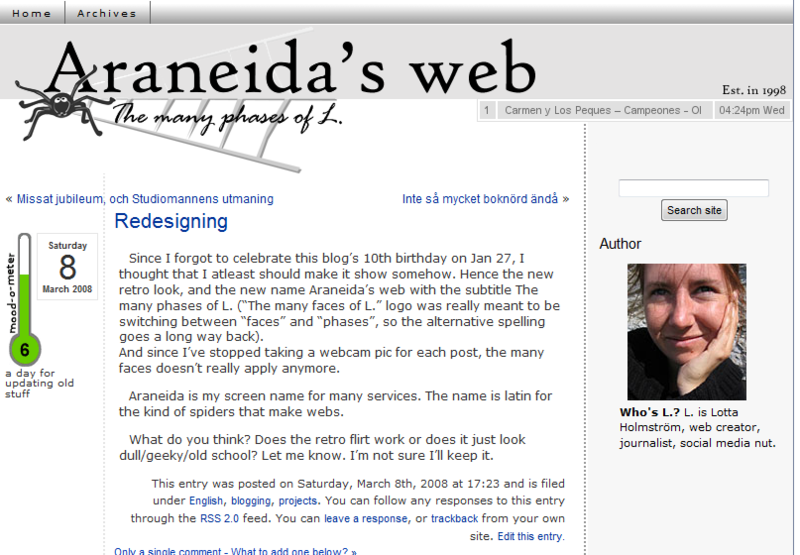 The name became Araneida’s web, and I used a grey logo for it. And now, it’s simply Lotta Holmström. For SEO reasons, but also because it’s not just Araneida’s web getting a facelift. I want to make this a place where all my online presence can be seen. I’ve put my latest tweet at the start of the page, integrated my Flickr feed and you can easily find all my LinkedIn, Youtube, Facebook, etc information. It makes sense. Having said that, there are places on the web where I make my mark without it showing here. 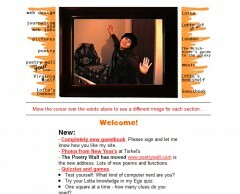 Skriva.net, for instance, the blog on creative writing that I’ve been neglecting for quite some time now. I hope you’ll let me know if there are things in the design bothering you or if you have suggestions of improvements.